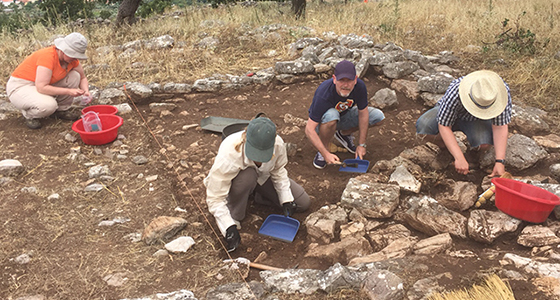 The third season of work at the fortified settlement of Malthi in Messenia started on June 5th. Excavation will be carried out for the coming four weeks. The overarching aim is to establish a chronological sequence for the settlement’s architecture and pottery. Preliminary results suggest that the settlement was occupied from Middle Helladic II to Late Helladic IIB/IIIA1 Early, but that most of the architecture visible today, including the impressive fortification, was erected in Late Helladic I. Thanks to funds graciously provided by Enboms donationsfond and INSTAP, this season the project continues work in three buildings in the north, west and on the central terrace.The project is run by Michael Lindblom and Rebecca Worsham and has Swedish, American and Greek participants this year.